I love nothing more than cold watermelon in the summer. It’s truly nature’s dessert. It’s kind of crazy to think that this vibrant pink melon creeps along on a vine on the ground. Nature! Hubs is obsessed with fruity popsicles and stops at nothing to bring the chemical-orange and pedialite-purple versions of the frozen treats into the house. Although delicious, some of these freezer section inhabitants are filled with a lot of unnecessary and unnatural stuff. Luckily, we both love naturally sweet watermelon, which just happens to make a great popsicle. I blended up a layered version of watermelon popsicles with great success. But if you’re not feeling like being super Pinterest about this, you can just make the watermelon layer. We won’t judge you. 1. 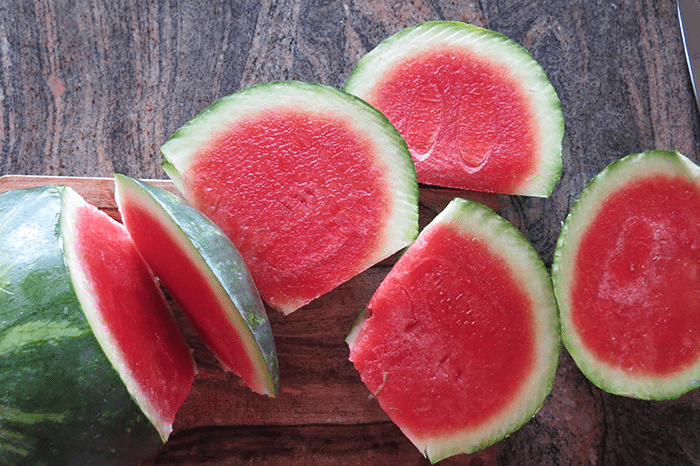 Cut your watermelon into chunks. If you’ve never cut a watermelon before, here’s an easy way to do it. I like to cut my watermelon into a cube, cutting six sides of the outside off with a sharp serrated knife and then cube from there. But you do you. It’s all going in a blender anyway. 2. 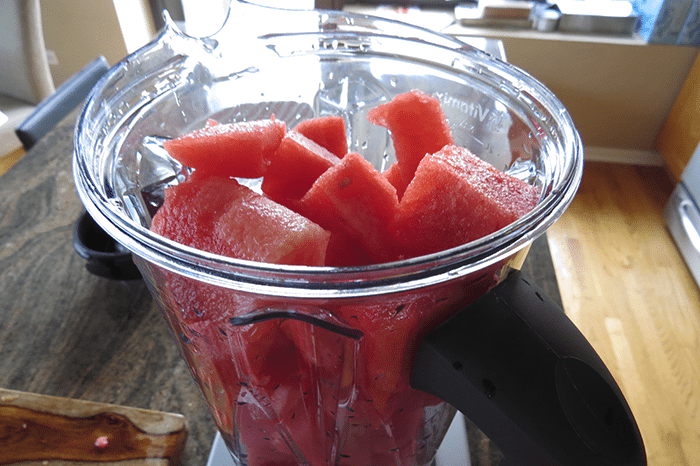 Put chunks of watermelon into a blender. You may have to blend a portion of the watermelon and then add other chunks – the watermelon takes up less space as you blend it down. 3. 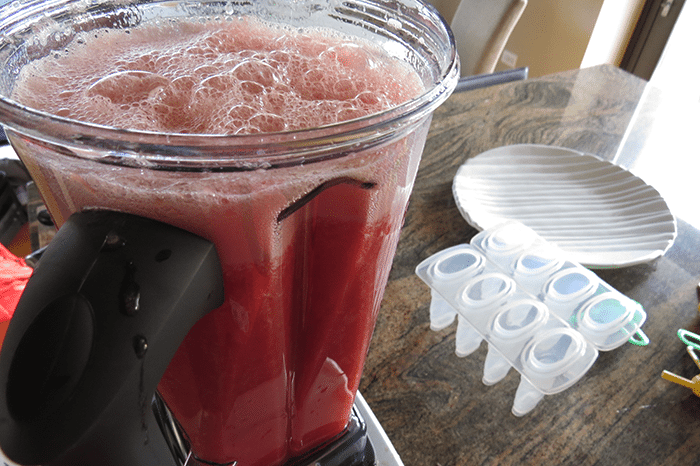 Pour the watermelon juice into your popsicle molds. 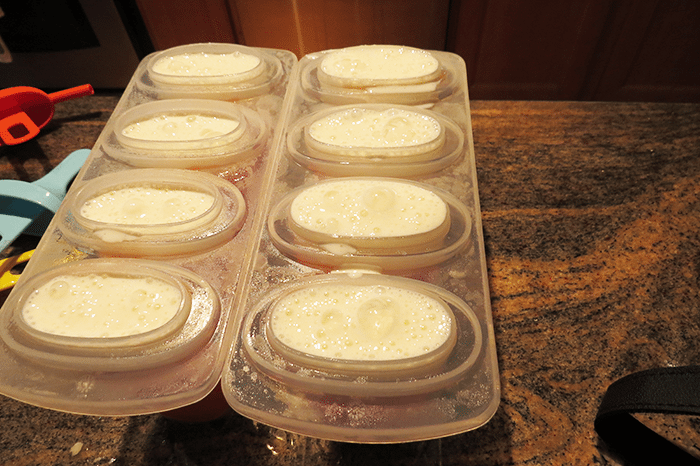 If you’re making the two-layered version, pour juice so that each container is 3/4 of the way full. 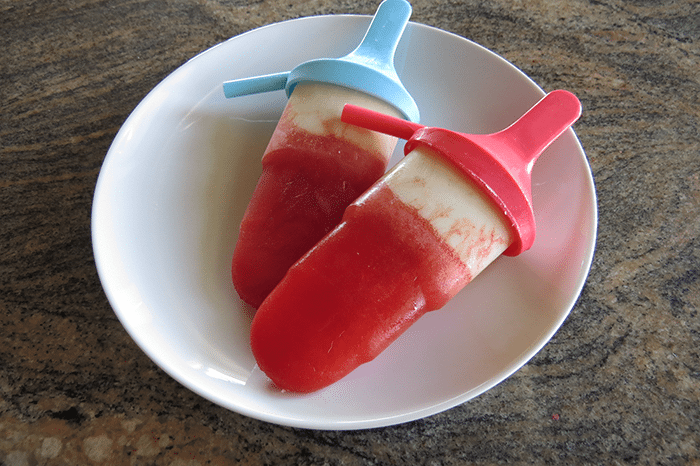 Don’t have popsicle molds? You can grab these Ice Pop Molds or pick some up at Bed Bath and Beyond. 4. Freeze. Allow to freeze for two hours. If you’re adding the second layer, be sure to put the popsicle stick in the mold – you want to make sure you don’t have to break through the watermelon ice later. 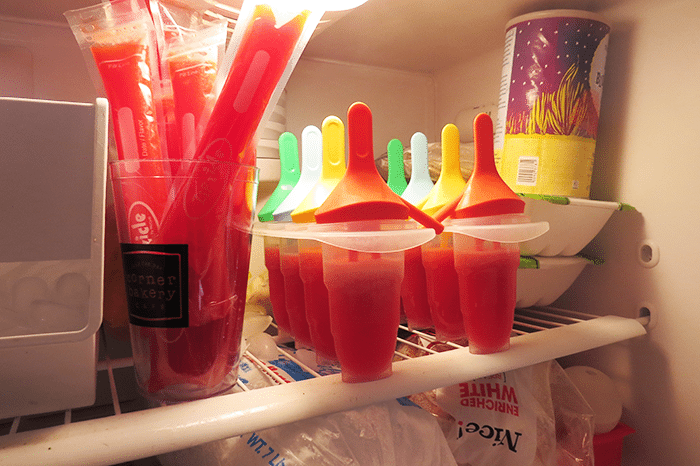 We had a lot of leftover watermelon juice, which I put into Zipzicle bags, an amazing and simple invention that allows you to make a healthy version of a childhood treat – the freeze pop. 5. Combine ingredients for the second layer in your blender. 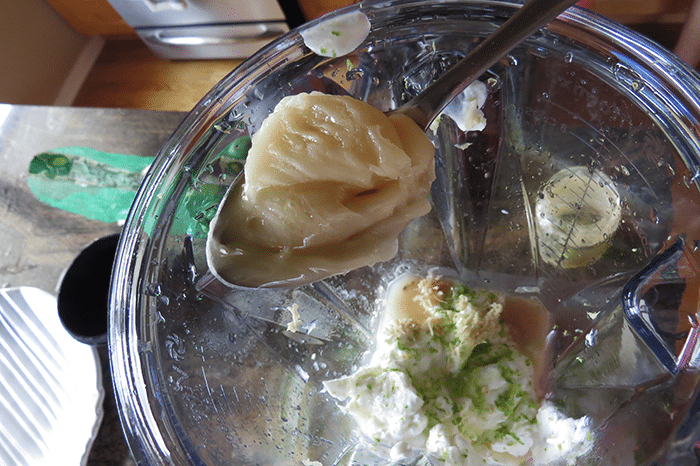 This layer is made up of the Greek yogurt, ginger, lime zest, lime juice and raw honey. This becomes a frothy, yogurt-y mixture that you should take a taste of and adjust accordingly. Not sweet enough? Add a little more raw honey. Want more tanginess? Lime it up. 6. Add the second layer to the pops. 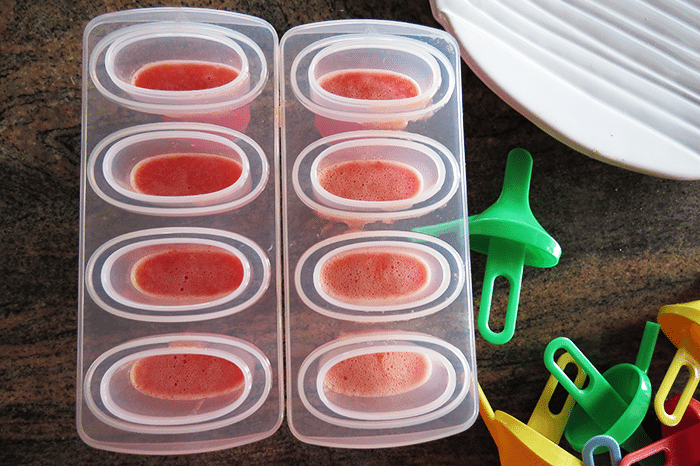 Take the frozen watermelon layer out of the freezer, remove the stick, pour the yogurt layer on top. Add the popsicle stick back to the pops and place back in the freezer for one to two hours or overnight if you can wait. 7. Enjoy as a snack or a dessert. Have trouble getting your pops our of their mold? Run the outside of the mold under some warm water. Loose Connections — How Many Friends Do You Really Have?